I LOVE your site. I have read so many of the books recommended here and my first go to site when I log on. I also have a question, maybe someone can answer. I read this book a couple of months ago and now can’t remember the author. I don’t have too much info but here goes. There is a guy named Sulley that helps the gal out once in a while. Also a handyman who does plowing and chores and charges even though he doesn’t do the work. She is very nosy and she did get herself locked in a large building in a winter storm and he rescued her. I hope someone can help me. Thanks in advance. Shirley, I’m so glad you’re enjoying the Cozy-Mystery site. 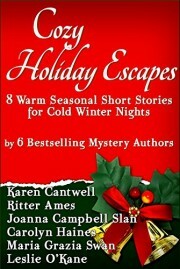 Aren’t the Cozy Mystery readers’ recommendations great? I’ve tried a whole lot of Cozy Mystery authors based on their recommendations >>> and I’ve added many new-to-me authors to my favorite authors list. It may be jenn Mckinley’s library lovers series. Thank you so much Deb, You are right. This is really a great site and after reading other comments and saw some questions asked, I thought I would give it a try . It really was driving me crazy as I did like listening to the book, now I will write down author’s names of the books I like. Deb, thank you so much for identifying Jenn McKinlay for Shirley! Thanks so much for posting our Cozy Holiday Escapes. We had so much fun putting this anthology together, and I was thrilled to work with so many of my favorite mystery authors. I love all the series they write, so it was as much a treat for me to read their stories as it was to write short fiction for my own cozy series. Love your site, and I was thrilled when I checked in today and saw my own name and cover 🙂 I’ve found so many good reads by checking your posts. Ritter, thank you for stopping by, and you’re welcome!